Where to buy contact lenses without a prescription to take advantage of cheaper prices online. This page is about how to find a website that will allow the purchase of contact lenses without a prescription; when you know exactly what lenses you need and have had a recent eye test so that the prescription is up to date. Believe me, it's not as easy as it sounds! NB: I'm not referring to "plano" lenses here, the ones that have zero power. These are often categorized as contacts with no prescription because they don't have any "prescriptive" power. What I AM referring to is ordering lenses from a website that doesn't necessarily ask for a copy of the prescription from your eye doctor. There are many many sites offering discount contacts online and the ones you can trust should definitely ask for a copy of your eye prescription. You might have lost your prescription. The prescription is unreadable - many opticians use a machine these days to "read" your prescription and all you get is a tiny print-out, which is virtually impossible to read, let alone, e-mail to an online supplier! Your last eye test was done by an optician in a country that is not accepted by the site you may be looking to buy from, so the prescription is not valid. When I first started to look for discount contact lenses on the web, as the prices in Cyprus were so high, I started with sites based in the UK, as that's where I used to live. While I found some great prices online, every time I tried to order, I was asked for my latest eye test results from a practioner based in the UK; a prescription from an optician in Cyprus was unacceptable. In frustration, I started to look at sites based in the US and, while shipping costs were higher for overseas delivery, the site I now use, AC Lens, welcomed orders from around the world and only asked me to fill in a simple online form stating my current eye prescription. While price is obviously key when looking to buy your usual lenses from online contact lens retailers, equally important is the ease of ordering, speed of delivery, the returns policy and, whether or not you need to give a copy of your prescription. I continue to use my current supplier, AC Lens, as they are tried and tested and they send me a discount voucher off my next order; they even send a reminder when my next order is due. I order a year's supply at a time to minimize the shipping costs. Tip: It never hurts to check prices when you need to place your next contact lens order. I've just placed my annual supply with Discount Contact Lenses. Why? Because the price was the same as my usual supplier but I also got 10% off using one of their special coupon codes for first time buyers! Lens Catalogue. This is the UK site for AC Lens, the supplier I use. Use this coupon to save £3 on orders over £30 with free delivery. Enter voucher code LC5 at checkout. Great prices on colored lenses including special effects contacts for Halloween at Vision Direct. Friendly, fast and easy. 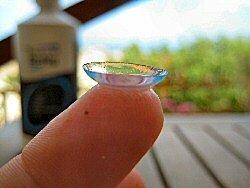 Order your contacts from 1-800-GET-LENS. Find the lowest prices on contact lenses at Lens.com. Find the 1-2 Week Disposable lenses you need at Just Lenses with a selection of more than 20 at low prices.